There are road-kill counts on line, as well as detailed descriptions of scourges like "Bali belly." And then there's the online "souvenir" collection that Scott and Laura Kruglewicz, a "thirty-something" Atlanta couple, are maintaining during their yearlong, 36-country odyssey at www.worldwidewanderings.com. Before they left home, Ms. Kruglewicz was a customer service representative in the travel industry, while Kruglewicz was a sales and marketing director at General Electric Capital. Now their souvenir bin contains pictures of things like a Russian candy bar and a mummified Egyptian cat. "We've used technology to do the thing that's most important to us -- share our experiences with those who weren't able to come," the couple wrote in an e-mail message from Bangkok, Thailand. "Let them travel vicariously through our adventures." Mr. and Ms. Kruglewicz are posting intriguing online interviews with some of the people they have met on the road, and their travels are being followed by a number of elementary school classes. Kristina Johnson and David Franke are circumnavigating the world, taking in sights as remote as the glaciers of New Zealand and the mountains of Nepal. But don't assume that this couple have dropped off the map. On the contrary. Click on the Web site www.wired2theworld.com that Franke and Ms. Johnson lovingly maintain, and you'll see a smorgasbord of trip details. The site is crammed with dozens of pictures, a pretrip journal, Ms. Johnson's global recipe collection, links to almost 30 related travel sites and a spot for sending e-mail to the travelers. The couple, who are married, are also using the Internet to stay in touch with some two dozen family members and friends, as well as to give advice to travelers who ask. They manage all their finances online, using tools like Citibank's online banking service and the online stock trading that is offered by Charles Schwab. Call it dharma bums go digital, even though they seem a far cry from what Jack Kerouac had in mind when he described his wanderings in search of spiritual truth in his 1958 novel "Dharma Bums." Just a few years ago, extended trips abroad usually meant that travelers would disappear, surfacing occasionally only through hideously expensive phone calls or rumpled airmail envelopes bearing ancient postmarks. But now a new breed of techno-nomad is taking to the road. These travelers are fortifying themselves with things like laptops, personal digital assistants, telephone adapter kits, digital cameras, photo-editing software and Web-design tools. They're using the Net not just to take care of pesky daily matters -- like paying credit card bills -- but also to trade tips with fellow travelers on the road, scout out resources in countries to be visited and post online travelogues. Many travelers may find the idea of tethering themselves to cyberspace while they are taking in faraway places downright odd. After all, much of the charm of travel is the chance to throw off the chains of daily life. Why bother taking in the exotic aura of, say, a camel fair in Pushkar, India, if you're busy worrying whether your errant relatives have turned your home into Party Central? Or whether your former employer now lists you as "deceased"? Many techno-nomads do, in fact, try to strike a balance when they're on the road so their cyberspace travels do not overwhelm their real ones. And they occasionally grumble about turning on their computers to find 80 e-mail messages. But for the most part, these travelers are happy to be wired, and their enthusiasm shows in the mounds of information they post online. Much of that information is decidedly homespun. Technology is also important to Almitra Von-Willcox, 51, from San Diego, who is on a walking tour of the world. Ms. Von-Willcox was a single parent for 18 years, and she supported her three children mostly by working as a cocktail waitress and renovating and selling rundown houses. She says it will take 14 years to complete her trip. She is traveling with an Apple Powerbook computer, a digital camera, a printer, a solar panel and a satellite-based navigation system. She is also posting her trip on the Web under the moniker of Almitra the Photo Gypsy, www.photogypsy.com. In a recent e-mail message from Australia, Ms. Von-Willcox wrote that she hoped her Web site would help "more people around the world learn the wonder and delight of the goodness of strangers, as well as the uniqueness of other cultures." She added, "I also hope to be an inspiration to those who need to challenge themselves." And John Berns, a former world traveler who is now living in Bangkok, offers a host of technical tips, among other things, at his Web site www.travelog.net, which he describes as "a geek, a digital camera and a laptop go around the world." That may be overly modest. Partly because Berns has received so many inquiries about extended travel, he has turned his Web site into an Internet publishing business for educating travelers. He posts his own global adventures, often within hours after they occur. Berns quit a job in Internet publishing in 1997, when he was 35, to hit the road. Now two of his closest companions are an I.B.M. Thinkpad 560 laptop and a Kodak DCS-120 digital camera. He also relies on Microsoft's Front Page software to write and edit his Web pages quickly. To process and edit his travel photos, he tends to rely on the Thumbsplus software from Cerious Software, although he also uses Photoshop 4.0, by Adobe. Even though a dried-squid vendor has set up outside his apartment, Berns feels "amazingly connected" to the digital world, he wrote in a recent e-mail message. When George Mason, Salli Slaughter and their two young daughters took off on a yearlong, 18-country "sabbatical" in late 1996, they also wanted to stay wired. On the road, the family used a Macintosh laptop, a Web site and an Internet service provider to receive more than 100 e-mail messages a week and get information from people in countries that they were about to visit, like Greece and Egypt. Even though Mason and Ms. Slaughter home-schooled their daughters, Samantha and Cassidy, while they were away, they used the Net to communicate with their daughters' teachers back home and teachers elsewhere, like a Bulgarian math professor they met in Japan. She helped Samantha, who was 14 when she left home, with her precalculus homework over the Internet. The Mason-Slaughter family used the computer daily. And the family's photo-packed adventure is still online at www.worldhop.com. It contains such decidedly personal notes as Samantha's guide to Asian toilets and Mason's experience teaching the hokey-pokey in Thailand. The Net even helped the family return home. After they got to England, near the end of their trip, they hunted for job leads by sending e-mail messages to everyone they knew. One of the messages landed Mason -- who turned 50 while he was on the road -- a public relations job in Portland, Ore., where he and the family now live. For the Mason-Slaughter family, the pros of staying connected on the road definitely outweighed the cons. When the family left home, Mason and Ms. Slaughter had just quit their jobs and given up their leased house. Two weeks into the trip, the family's pet wolf died back in Anchorage, leaving them feeling more disconnected. "We were totally adrift," Ms. Slaughter said recently. "So the Internet became a real place -- it wasn't just cyber anymore." 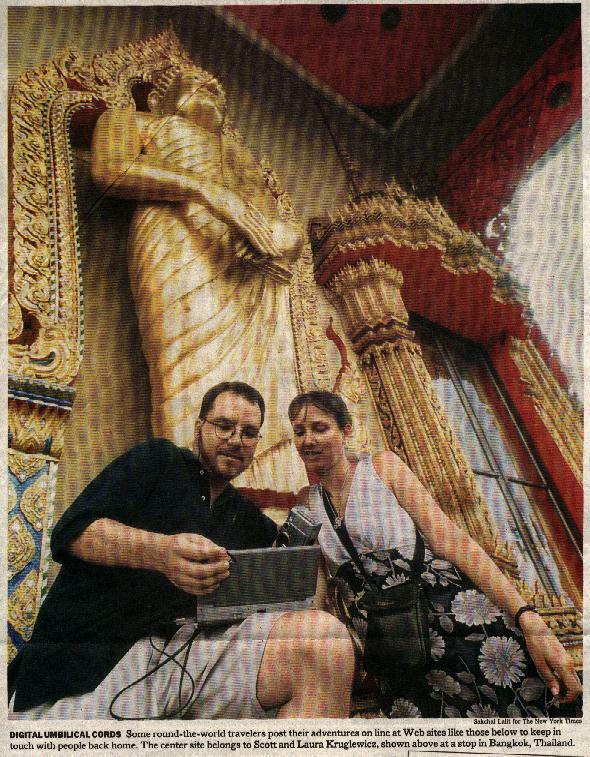 Of course, going digital on an extended highway abroad isn't always easy, as Ms. Johnson and Franke have found. Before setting out on her travels last fall, Ms. Johnson, a former seafood chef, spent two years preparing for the trip that she and Franke, a former bilingual primary school teacher, would take. Their gear includes a Toshiba Libretto laptop that weighs 1.87 pounds; a Ricoh digital camera and a telephone hook-up kit that includes numerous adapter plugs, adapter jacks, a telephone line tester and an acoustic coupler. In addition, they are paying roughly $28 a month for both an Internet service provider and a service called iPass, which provides them with dial-up software and international-access phone numbers. Because iPass relies on local phone numbers, wherever possible, for access to the Internet, Ms. Johnson and Franke are using it to cut down on their connection charges overseas. But those charges are adding up. Ms. Johnson and Franke currently pay between $4 to $12 an hour for Internet access alone, which runs $20 to $40 a month. And then there are the costs of simply dialing up the Internet. Because the couple are staying mostly in hotels, even local phone calls tend to be extremely expensive. And when local numbers have not worked, Ms. Johnson and Franke have had to gain access to the Internet through long-distance calls. Sometimes they have also had to turn to cybercafes. That has usually been the case when iPass has failed them, or when they have been unable to afford a room with a phone or when the quality of the phone lines has simply been too poor. They estimate that they spend $15 to $30 a week for computer-generated phone calls and cybercafes. But relying on Internet cafes can create its own set of headaches. When Geoff and Lauren Slater took off on a journey in late 1996 that eventually took them to more than a dozen countries, they soon discovered that cybercafes tended to sprout up and disappear with alarming frequency. And access to the Internet from the cafes varied enormously in price; a cafe in La Paz, Bolivia, charged the Slaters 50 cents an hour, while a cafe in Chile charged them $8 an hour. Before he went on the road, Slater quit a job as a planning director for Boston's transit system, while Ms. Slater was an education services manager for a software company. Now the couple call Vermont their home, although their global adventures are still posted online at the www.madriver.com/users/rtw2vt site. Matt Donath, a former long-term traveler who is now home in Chicago, spent weeks in India before he finally found a cybercafe that had working equipment. He also discovered that many cafes he visited would deliberately overestimate the amount of time he spent online, often tacking on the time he had to spend simply waiting to be connected. Clearly, money is useful to the digital dharma bum, and several sites post sponsorship information. Some of the travelers have managed to attract sponsors, although many appear to be flying solo. Ms. Von-Willcox said she had not approached anyone for money yet; the companies listed as sponsors, she said, have contributed "stuff." Many travelers now wouldn't dream of circling the globe without being wired. The Slaters, for example, relied on the Net to stay in contact with friends and family members, and Slater also turned to it to keep up with the Boston Patriots. Sometimes digital connections have helped travelers in unexpected ways. Take Donath. He cut short his round-the-world trip in Singapore last winter, when it was discovered that his wife and traveling companion, Sybil, had breast cancer. Shortly after they came home, they received in the mail a video about breast cancer that had been sent by an Internet user who had visited the couple's Web site at www.travel-library.com/rtw/donath. Donath said the video is helping his wife cope with her disease. Before the recent explosion in the number of personal Web sites -- including those written by travelers like himself -- receiving such support "would have been unimaginable," he wrote in a recent e-mail message. Last modified: February 05, 2000 Photographs and text � of the respective publishers. All Rights Reserved.